Long time ago, when the earth was young, all things in this world could speak. Animals could speak, the water could speak, the skies the stars, the four-leggeds and those with wings, even the little bugs. “We shall make this world the way that it will be comfortable for those that are going to live here, the Indian people. He will then take care of it in the right way because the instructions will come from us.” Those are the words of wisdom from the animals and all things around him. Thus are the stories that I’m going to tell.The coyote will be the main character and his older brother the wolf. Many, many moons ago, to the south, a journey was to be made throughout the world into the high countries of this world. Two brothers lived in a “carniv”(tipi) at the top of Pikes Peak. The Older Brother [Sunif, the wolf] wanted to put the people here and there, so he made a little bag and this he will pack on his back and as he moves to the north he will distribute these little people throughout the world. All will be placed in the right place. He did not tell anyone about what he was doing. But his brother, Yahowitz (the coyote) was a curious animal. In Indian stories he was a trickster. He was curious. And he murmured “Ahat iya aqay? what is he doing?” The Older Brother was breaking these small twigs, to small size and putting them in a bag. But the Younger brother watched without getting too close. Now the older brother Sunif decided to take a walk and when he was gone the curiosity got the best of his younger brother Yohowitz. Because in the bag he could hear people talking. There’s music going on in the bag. He’d listen real carefully and he would say “Niahook?” “What’s it saying, what is in there.” So he took his flint knife and he cut a little hole on the side of the bag. In the meantime, his older brother is gone, but he knew that he’s getting close again. And when he looked in through the hole the people saw him. There were people in there. The sticks had turned into people. And some jumped out, and about that time the older brother he’s come back again. Not knowing what had took place he put the bag on his back. And he moved on his journey. As he was going along he’d be singing a song. [Drum beats] Like heart beat of the earth the drums would be going and he’d be singing to that. Every once in while he would stop and reach in the bag and put some people down on the earth and say “You will live here” but as he went on he noticed that the bag was getting lighter and he knew that he didn’t put that many people out. Finally when he got to the high place waaaay up in the mountains, then he knew what was going on. There was a hole in the bag and all the people had jumped out. But they are still in there that he left in there and he talked to them “You my people, you my children, I’m going to put you over here. You will be called the Yutica, Yuta, the Ute. You will live in these mountains for these shining mountains will be your home. From here, you will see across the plains to the east and to the north and to the west and to the south.” And that’s how the distribution was made and how the Utes were placed on the mountains. Then all the people that were supposed to have been placed around they dropped off and those are the little tribes here and there scattered to the south to the west and that’s where we came from. On early Spanish maps from the 1600s and 1700s, Pikes Peak is noted as a cerro or high, lone butte. This error isn’t corrected until Anza’s historic campaign against the Comanche in 1779. Maps after this period correctly show Pikes Peak as part of a range of mountains, the Sierra Almagre (Red Earth Mountains), and show Ute Pass as the Doorway to the Red Earth Mountains. 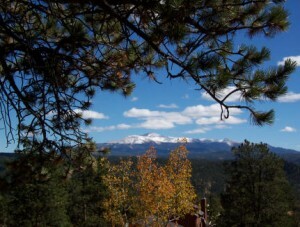 The next European traveler to note Pikes Peak is its name sake, Zebulon Montgomery Pike, in 1806. Though he was unable to climb to its summit at that time, his writings brought notoriety to the mountain he called “Grand Peak.” It was the expedition of Major Stephen Long that brought the first European climbers to Pikes Peak, when Dr. Edwin James successfully climbed to its summit in 1820. Though Long named the peak in James honor, it was the popular writings of the explorer John Charles Fremont that permanently stuck the mountain with Pike’s name. 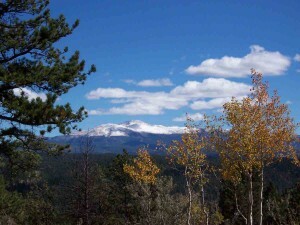 Pikes Peak Historical Society Museum covers the history of this great mountain and the surrounding region. To learn more about the history of our area click HERE to read excerpts from Celinda Kaelins’s book, Pikes Peak Backcountry. We will gladly open upon request for school groups, social groups or for you and your family and friends. Just call 719-748-3861 to schedule a day and time at least 24 hours in advance. Our Museum admission is free. Copyright © 2019 Pikes Peak Historical Society. All Rights Reserved.